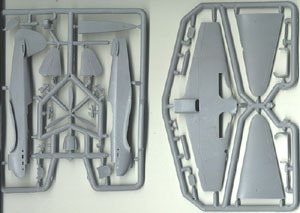 The Amodel Yak-1 (early) consists of 74 green-gray injected parts, with an additional 4 injected clear parts. 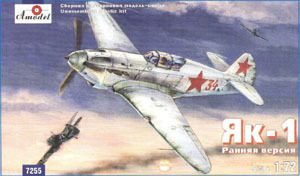 Decals exist for two schemes (the descriptions coming from the instruction sheet), a Yak-1 supposedly flown by Golubov of the 18 th FAR, spring, 1943 (highly unlikely); and a generic Yak-1 in winter camouflage, 1941-1942 (although research places “Red 34” with the 42 IAP). 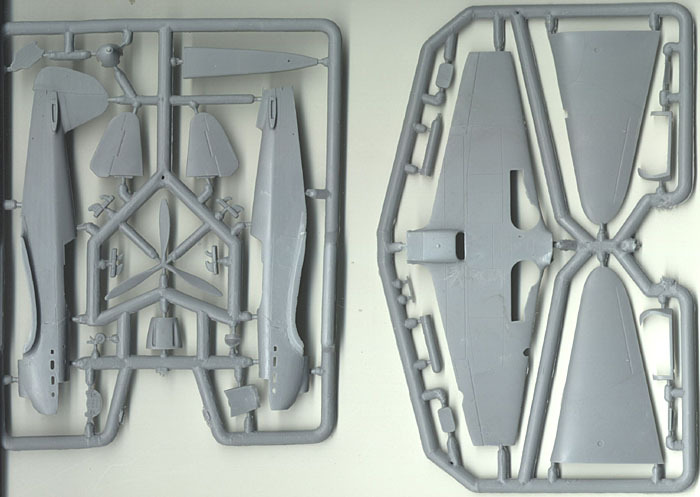 While the kit only builds the razorback, early Yak-1, it appears that maybe Amodel will release the other versions – the later Yak-1 razorback and the Yak-1 with the bubble canopy. That will be nice. There is only one option in the kit, although not listed in the decal schemes, and that is for skis instead of wheeled undercarriage. Overall the level of detail is decent enough in this kit. The cockpit is pretty complete with most parts separate. 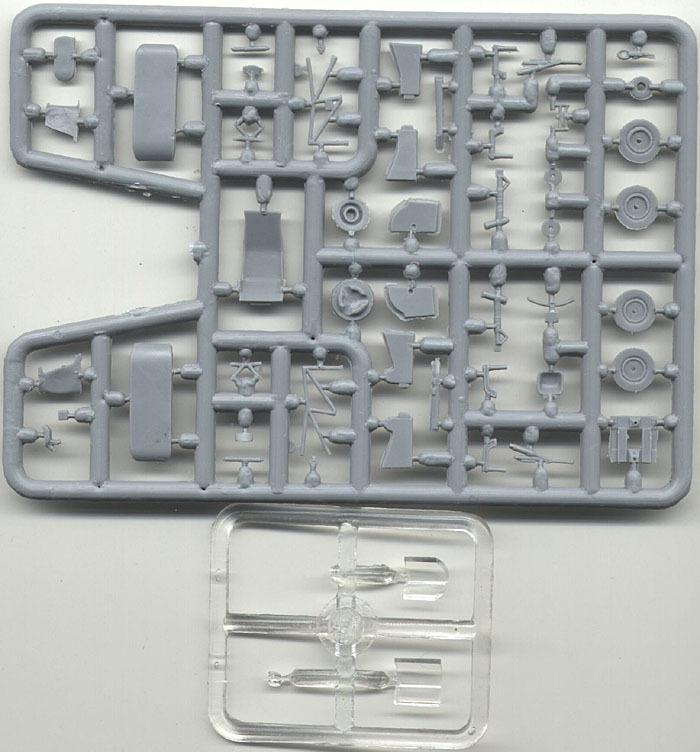 This is really nice except for one nit-pick – the “to scale” parts are attached to the sprue with very thick gates. This will require some patience and tediousness to remove these parts without breaking them. Unfortunately the kit lacks in one major area, that of the fabric covered parts of the airplane. The rear fuselage was fabric covered, and there’s a definite “scallop” effect that can be discerned on the real thing. How one goes about adding that effect is unknown at this time – maybe by adding strips of plastic where the stringers are, sanding the edges flush and the “filling in” the area between the stringers with Future. That could work. However, with the fabric-covered control surfaces, I plan on replicating these with washes and drybrushes. 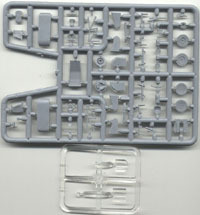 All in all a very nice kit, and a surprise from Amodel. They had a couple of “unknowns” listed in their catalog, and it’s nice seeing the early Yak-1 as one of them. Unfortunately Amodel has forgone any representation of fabric detail, and this may unfortunately turn a few modelers off this kit. When I figure out a way to easily replicate this, especially on the rear fuselage, it will be in my full build article.